Former US President George H.W Bush has died aged 94, his son George W Bush announced, following a long battle with a form or Parkinson’s disease. Longtime friend of the 41st American President, James Baker, revealed to the New York TimesMr Bush’s touching final words before he passed away at his home in Houston, Texas. In his final hours, Mr Bush received a call from his son George W Bush to say a final goodbye. His son said he’d been a “wonderful dad”, to which Mr Bush replied: “I love you, too”. He later died, surrounded by friends and family. Tributes to Mr Bush, dubbed by some as “the most successful one-term president”, flooded in from around the world, even from those on the other side of the political divide. Former Soviet leader Mikhail Gorbachev only sung praise for the former president, despite communism crumbling on his watch. Their relationship allowed Bush and Gorbachev to push through some of the most significant US-Russia arms control agreements in history, including the Strategic Arms Reduction Treaty. They found that mutual arms reduction was the cornerstone of stability between their nations. It’s a salient lesson at a time when relations between the US and Russia have hit their lowest point since the Cold War, and Presidents Donald Trump and Vladimir Putin have called for substantial investments in new nuclear weapons, risking a return to an arms race. “Gorbachev and Bush showed that cooperation on arms reduction can have a very stabilising effect on the situation and the relationship,” Mr Gorbachevs former translator, Pavel Palazhchenko said. 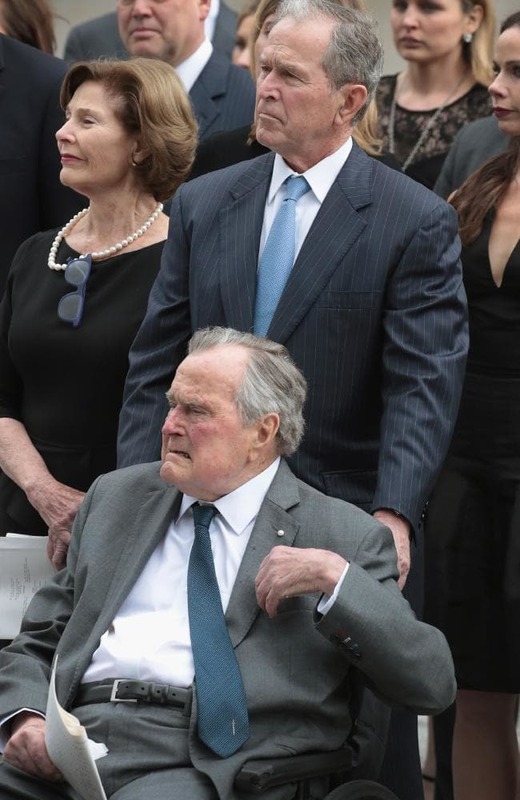 Mr Bush’s son revealed his father’s passing today in an emotional statement. “Jeb, Neil, Marvin, Doro and I are saddened to announce that after 94 remarkable years, our dear dad has died,” George W Bush wrote. “George H.W Bush was a man of the highest character and the best dad a son or daughter could ask for. Current president Donald Trump and first lady Melania said they “join with a grieving nation to mourn the loss” of George Bush Snr. “Through his essential authenticity, disarming wit, and unwavering commitment to faith, family and his country, President Bush inspired generations of his fellow Americans to public service — to be, in his words, “a thousand points of light” illuminating the greatness, hope and opportunity of America to the world,” a Trump issued statement read. “President Bush always found a way to set the bar higher … with sound judgment, common sense and unflappable leadership, President Bush guided our nation, and the world, to a peaceful and victorious conclusion of the Cold War. Former president Barack Obama said the nation had lost a patriot. Mr Obama credited him with “expanding America’s promise to new immigrants and people with disabilities and reducing the scourge of nuclear weapons to build a broad international coalition. “And when democratic revolutions bloomed across Eastern Europe, it was his steady, diplomatic hand that made possible an achievement once thought anything but — ending the Cold War without firing a shot,” he said. Former US Secretary of State James Baker said his legacy would forever be etched in the history of America and the world. That legacy was marked well before his passing an indeed his inauguration as president which was praised for humility and unity. Former Australian Prime Minister John Howard said: “The late President possessed an endearing sense of humour and always exhibited immense public grace. He was the patriarch of a great American family. “At all times he was a true friend of Australia. He visited our country on a number of occasions. He was the first American president to address a joint sitting of our national parliament,” he wrote in a statement. “From the moment I met him as a young governor invited to his home in Kennebunkport, I was struck by the kindness he showed to Chelsea, by his innate and genuine decency, and by his devotion to Barbara, his children, and their growing brood,” he said. “I will never forget George H.W. Bush and President Clinton meeting me in my old hometown of New Orleans to show support and raise money after Hurricane Katrina. I send my love to his family tonight,” Ellen DeGeneres wrote on Twitter. The New York Stock Exchange announced that it would close for one day in honour of Bush.